Our incredible father, husband, grandfather and beloved friend, John Morse, died peacefully at his home in Laguna Beach on March 10, 2018. John, known to his friends as “Jack,” was born April 29, 1934. He came to Laguna Beach at nine-months-old, and aside from his time away for college and his time in the Army while serving in Korea, he lived his entire life in Laguna until his passing at the age of 83. He was an extremely lucky man and he knew it! Jack graduated from Laguna Beach High School in 1952 and continued on to receive his bachelor’s from the University of New Mexico. He was a retired Los Angeles County probation officer of 30 years and dean of students at Santa Margarita High School, respected by his peers and loved by his students. Upon his retirement, Jack spent his time focusing on his passions of music and teaching. 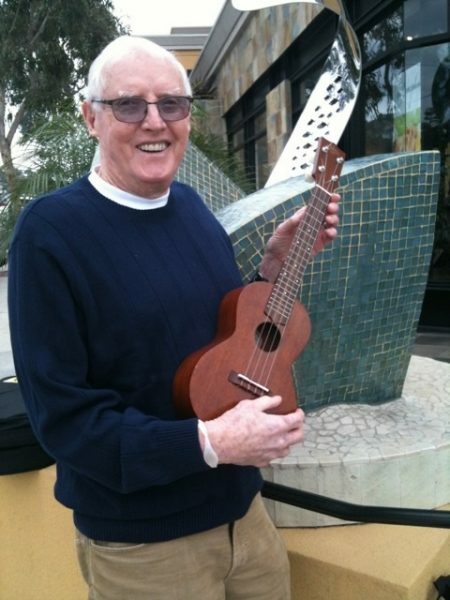 He was an accomplished ukulele player who continued to serve the local community teaching ukulele classes and building incredible friendships at the Susi Q Center in Laguna Beach. Jack loved the ocean, playing and teaching the ukulele, weekly coffee gatherings with his friends, and watching his grandkids grow up, always encouraging them to do their best and reach for the stars. Nothing was more important to him than his family and friends. Jack’s signature everyday look was a Reyn Spooner Hawaiian shirt with jeans and a ukulele. Jack loved his time as a Laguna Beach lifeguard in addition to surfing, fishing and diving. No one knew the beaches of Laguna better than he did. That is the simple life Jack loved. He was always there to greet you with a smile, offer sage advice, or provide a steady hand. Jack was one of the kindest people you could ever meet, opening his heart to many. He is survived by his wife of 49 years, Susan Morse, his four children (Gretchen, Peter, Megan and Tim), and the eight grandchildren he adored. Our incredible father, husband, grandfather and beloved friend will be missed. Susi Q Center, (Laguna Beach Senior Center) 380 Third St., Laguna Beach, CA 92651. Susan and family, so sorry to read of Jack’s passing. Those were the days my friend.